Skeptical Science readers may already be familiar with the dismal performance of the Canadian Federal Government on climate change. The Canadian contributors to Skeptical Science expressed our concerns about the erosion of our country’s science for political ends in a blog post here in March of this year: PMO Pest Control: Scientists. We have also run a number of posts on the rapid development of the oil sands, for example: Tar Sands Oil – An Environmental Disaster and; Alberta’s bitumen sands: “negligible” climate effects, or the “biggest carbon bomb on the planet”?. This summer, Canadian scientists have been taking their protest to the street and last week there was a rally in Victoria, British Columbia. In an event organized by Ken Wu, Canadian scientists and concerned citizens rallied outside a Federal Government building in Victoria on Friday September 14th in protest against the Federal government’s policies that have been cutting science budgets, shutting down vital projects (e.g., PEARL, ELA) andmuzzling government scientists. People jammed the sidewalks in downtown Victoria to hear speeches byclimate scientist Andrew Weaver, Canadian Green Party leader Elizabeth May and “Dr X”, a marine biologist working for the Department of Fisheries and Oceans who appeared in disguise for fear of losing his job. 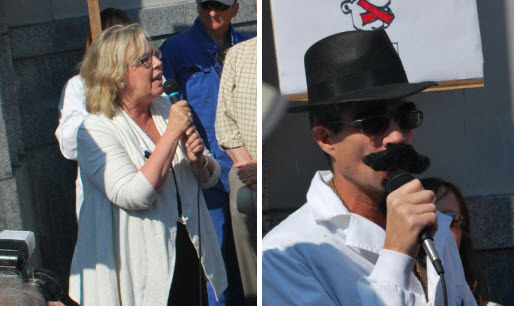 Green Party Leader Elizabeth May and marine biologist “Dr X” (hiding behind a false moustache) speaking at the Victoria rally. (All photographs by the author). Andrew Weaver expressed his outrage about the cutbacks in spending on research and the suppression of free speech for federal scientists. 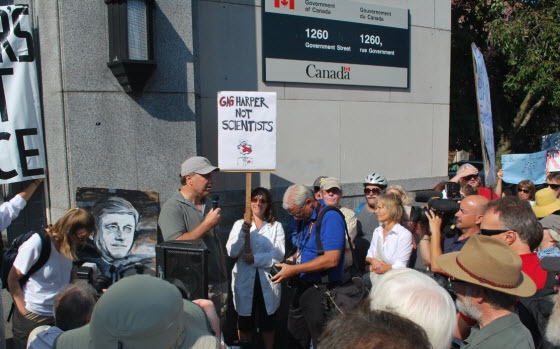 Canadian scientists are no longer allowed to speak directly to the press, he said, but now journalists must get their information from government information officers who deliver carefully scripted “media lines”. Andrew Weaver wrote a recent newspaper article on the Canadian government’s anti-science policies, here. On September 20th, Weaver announced that he will be seeking the nomination to run as a candidate for the BC Green Party in the elections for the provincial legislature that will take place in 2013. Climate scientist Andrew Weaver addresses the rally. Elizabeth May spoke with her usual verve, saying that the Harper government seems intent on replacingevidence-based policy-making with policy-based evidence-making. She has just written an article on the rally, with a long list of the government’s recent anti-science actions. “Dr X” recounted how the staff and funding cutbacks were making his job impossible. His research traces the industrial pollutants in the ocean through bio-magnification into some of the iconic marine species of the Pacific Ocean, salmon and orcas. He is bitterly frustrated at being unable to carry out his professional responsibilities. And he fears the personal consequences should his identity become known. 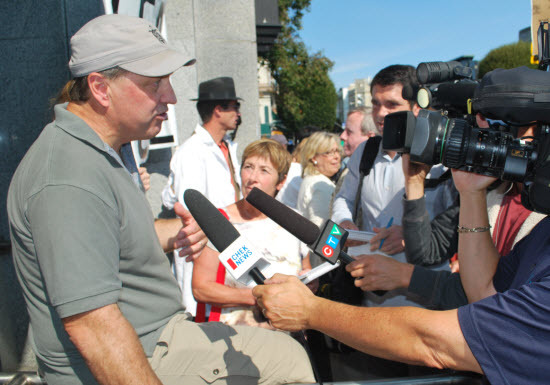 Andrew Weaver giving an impromptu interview to TV news after the rally. Dr X and Elizabeth May in the background. The Canadian government claimed, in the last budget, that it was closing the independent advisory group theNational Round Table on the Environment and the Economy (NRTEE) to save its $5 million annual operating cost. However, in the same budget, the government allocated an additional $8 million to the Canada Revenue Agency to audit the activities of environmental charity groups. The common factor appears to be to stifle dissenting opinions on the government’s environment and resource exploitation policies, rather than to reduce public expenditures. The historically unprecedented recent lows in Arctic sea ice recorded in 2012 demonstrate unequivocally that our climate is undergoing rapid change. As Caitlyn Baikie wrote here, for Canada’s indigenous peoples,climate change is already a reality, threatening their lives and their traditional cultures. They, especially, deserve a government that is prepared to do all that it can to understand the rapid transformation that is taking place in their homelands. And, as a major producer and consumer of some of the planet’s most carbon-intensive fossil fuels, Canada’s government has a special responsibility to investigate—and to mitigate—the effects that the exploitation of these resources is having on the climate. Canada’s scientists have a proud record of achievement. Like scientists everywhere, they are happiest when working quietly in their labs. It takes a lot to get them as mad as hell and take to the streets. But, as we saw in Ottawa earlier this summer and last week in Victoria, they are not going to take it any more. Effective public policy needs to be informed by the best possible science. In order to make up its mind on policy proposals, the public requires free access to information and analysis directly from the scientists that they fund, unmediated by government spin. The unfortunate reality is not that Prime Minister Stephen Harper does not understand the importance of science in helping discriminate between responsible and irresponsible policy-making, but rather that he understands the power of science all too well. Addendum, September 29, 2012. Journalist Mike de Souza, writing in the Calgary Herald, points to a briefing document prepared for Federal Environment Minister Peter Kent by the staff of Environment Canada. The document was obtained through access to information legislation. It details the many impacts that Canada is experiencing now as a result of climate change, driven by an average rate of increase in temperature for the country of 1.6°C for the period 1948-2010, double the global average rate. The change in climate results in a long list of costly effects, for example: damage to BC’s forests by pine beetles; shorter seasons for Northern ice roads; lower water levels in the Great Lakes; changes to surface water availability in the Prairies; and increased coastal erosion rates. Some of the information came from the recently disbanded advisory council, the NRTEE, referenced in the article above. Needless to say, this information has not been communicated to Canadians by their government. This entry was posted in Uncategorized and tagged BC, Canada, Politics, Weaver. Bookmark the permalink.